I have fallen in love with my vintage Virginia Hospitality cookbook, and made another recipe from it this weekend, when two days of pouring rain led me to baking. I made the pumpkin bread. It is delicious, and the boys have been devouring it in the mornings for breakfast. Preheat oven to 350*. Mix all dry ingredients; add remaining ingredients and mix well. Bake in 2 well greased loaf pans 50 - 60 minutes. I modified the recipe just slightly - the original called for raisins and walnuts but I preferred to use chocolate chips instead. In addition, I found I had to bake mine for 65 minutes for them to be completely done. Be sure to check the middle of your loaves with a knife before you turn off the oven! I am posting this recipe at the special request of Elizardbreath Speaks - hope you enjoy it! 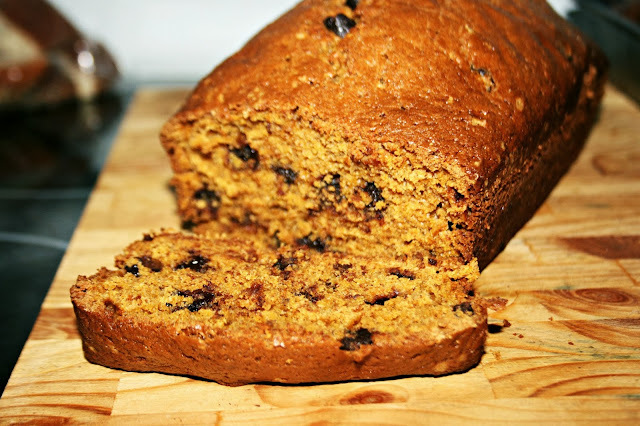 I love the smell of hot pumpkin bread. You probably made your boys happy with that. Sounds delicious, especially with the chocolate chips! What a great recipe for this time of year! I was just looking for some pie pumpkins over the weekend so I could make some breads, soups and smoothies. Your bread looks fantastic. My neighbor just gave me a half-loaf of pumpkin bread on Sunday afternoon. HEAVENLY. Chocolate chips sound like a wonderful addition! Yum! Chocolate and pumpkin go really well together. You would not be able to trust me in your kitchen - if you turned your back, i would sneak & devour a handful . .
sure looks great - i can almost smell it from here . . . .
That sounds so good! Thanks for sharing the recipe! Looks delish! We don't really have the pumpkin tradition here.. It is beautiful and looks just like fall!!! Oh yes - replace raisins with chocolate chips every time! Yummy! It does sound so good! I love spicy banana bread. I'm not sure I ever had pumpkin bread. Looks like it would be delicious on a cold winter day, with a cup of coffee. Chocolate chips are always better than raisins! I am the new follower of your wonderful blog. I hope you can visit my pages, if you wish. I enjoy reading your writings and looking at your photos. I see that you like running. It is a great exercise. Greetings from Poet Starry Dawn. Looks wonderful! Pass the cream cheese! I can see why the boys are loving this; yum. You've had rain too? Baking is a great thing to do on those days!